IMAGINE finding out that you have a cancerous tumor just beneath your skin. Imagine a doctor cutting you open and exposing the festering mass within, a mass that is gradually eating up the healthy tissue around it, eroding bone and insidiously spreading by blood to almost all parts of your body. Imagine that after doing so, the doctor sews you up again, and then, as though it were the most natural thing in the world, tells you to simply go on with your life, to just pretend the cancer is not there, because removing the tumor would be too much trouble, too messy. And to all your protestations he replies that he is the best there is; he knows best. How would you feel? Could you do as the doctor says and go on with your life, knowing that you have within you a disease so deadly that unless it is excised and treated aggressively, you would certainly die? Absurd as this may seem, it is what the present leadership has done to us. If anything good came out of the political scandals of the past year, it is to expose like never before the extent of the illnesses that plague our national life. Like most cancers, these illnesses had been allowed to grow and feed on us for decades but we did not really know how serious and widespread they were until we heard the "Garci tapes" and then witnessed the ruthless cover-up that ensued, a cover-up so shameless and so crude that it only served to expose more of the nation’s decay. Yes, we had always known we were not well, but only then did we get to glimpse the hideousness and smell the stench of what truly lies within. This would have been well and good if we had seen the process to completion, if we had been offered a definite cure. Unfortunately, this was not the case. And so today we have a people more wounded than ever before. No one has been spared this assault. Nothing was left unscathed. And the saddest thing is that while the poor and ignorant have continued to suffer; a great majority of the "thinkers," the people who could hold the key to changing our course, have been left more cynical and more hopeless. Because it has become too painful to think and to feel, many have taken refuge in apathy. Among the most wounded of all are the professionals: physicians, lawyers, engineers, teachers, soldiers, and many others; men and women who have tried, despite all the odds, to contribute to nation building in the most noble and honorable way they can. Many can no longer stand to read the newspapers which have become sad reflections of empty, inane maneuverings of politicians and big business, actors in a mad play who can no longer address our true problems because they too are trapped within a system where only the wily can survive, and where noble dreams and aspirations are shot down by a culture of corruption that we are expected to accept as "realpolitik," Filipino style. But as in all things, any excess is eventually met with the universal need to restore balance. And so like the proverbial "darkest night" that always comes before the dawn, I know in my heart that our dawn is fast approaching. I cannot remember a time when I had to give so many "inspirational talks" to so many groups of graduating doctors as this past year. In all of them, the graduates had one common question: "How can we survive in our country today where staying and serving our people has become so difficult to do?" And to this question I had one general answer: "The only way to survive is not to make survival your goal. You must strive to excel so that you don’t become just doctors, but true healers." One of the principles healers have known since ancient times is that one cannot effectively heal unless one is healed himself. The Navajo medicine man and woman call this "good belly." Unless one feels whole and good in the "gut," one cannot heal another. This principle will always hold true. But in a country of the walking wounded, how does one heal? First we must accept and recognize the disease. We have a serious cancer eating up our nation from within. It has been there for a long time; a variant of the same cancer that Rizal spoke of over a hundred years ago, albeit deadlier and more widespread now than before. It cannot be cured by the opium of athletic victories or the diversionary burlesque called charter change. No less than a skilled surgical excision of the bulk of the tumor will be necessary to help in our healing. And while we ordinary men and women are not capable of such a surgical excision, we can help by starting what we in medicine call the "adjuvant" therapy. In short, rather than just pull our hair and wait for a coup to happen or for a hole to suddenly open up and swallow the majority of our politicians, we can do something. Rather than feel helpless, we can choose to be instruments, not just of physical healing, but of hope. "Big Medicine" is what we must practice. Like the babaylan of our ancestors, let us not limit ourselves to the physical because this is not what our times call for. Our people are in desperate need of inspiration, of something and someone to believe in amidst all the confusion, the treachery, the lies, the deception, the betrayal all around them. We can be this to our people, simply by being true to our calling. In a country where apathy and cynicism abound, let us show them empathy and compassion. While corruption seems to have penetrated every nook and granny of our government and its institutions, let our clinics and offices be havens of honesty and integrity. And while honor seems to have disappeared from the Filipino’s vocabulary, let us show them just how much they can trust us with their lives. As long as the nobility of our profession remains, then there is hope. Not all of us will have the chance to speak to large crowds or get their essays or thoughts published. But we all occupy such a privileged and powerful position; second to God in many ways. Let’s use this power to the utmost. Each patient we see belongs to a family, that belongs to a community, that belongs to a province, that belongs to this benighted nation of ours. We are all UP graduates. We are our people’s scholars, and they look to us for healing. Never have our people been as wounded as they are today. Go then and heal the nation. And you can do it, even if you must do it one patient at a time. We the filipino here in Japan wants to have a new leader and by our law we want Noli de Castro to lead our nation if we can't have snap election right away because we believed that till now the TRUTH from 04 election is not et clear and from CBCP statement we must all UNITE together for a change in our gov't system and we don't have any choice except to let Noli de Castro to be our president because by legal law he's the one to replace GMA and we believed that NOLI will be a strong leader with good integrity and he must choose his gov't. cabinets with good moral and integrity for the sake of our nation so that other countries all over the world will realized that our country is with moral values and honest in way of stoping corruption so that our country will GROW like other country too . We want the young version of military with good intention of protecting us not by self interest and also we want also Chiz Escudero , Mar Roxas , and other good young politicians whose intention is for our country not for self interest but for the filipino people most especially the poor ones who have been neglected long time ago and only the rich people gets richer and the poor gets poorer so we believed from his highness Lagdameo of CBCP statement that we must seek the TRUTH because God will set us free if those guilty will speak out the truth . We must all remember that no matter how you the guilty persons are they'll never aim happiness in their lives and they can't never sleep soundly because they'll be bother from the big sins they did to our country most especially from God. God will always punishes the evils no matter how evils pray hard still their paryers will never be answered from God because the evils heart is black and can't never be forgiven if they don't know how to reveal the TRUTH . God is good only to those with good heart and good intention to our country . Sana po we'll never forget that KARMA will always happens . Mahal po namin ang atin BANSA like Pacquaio did from his boxing fight to aim honest dignity in a legal way and our country was united as one country when pacquiao fight was aired but sad to say that he was used again and hopefully Pacquaio will have his own decision to stand from his own words since he is a very religious person so hopefully Pacquaio song entitled PARA sa IYO is for our country alone . We will still keep on praying that one day when we filipinos woke up in the morning our country will have a NEW good LEADER already to lead our country into a better tomorrow . I enjoyed the article, and loved the sentiment. I live in the Philippines and I never stop hoping things will change for the better. Actually, things are getting better here, but SO slow. I say this looking through the eyes of history. As an American who loves history I am fascinated by Filipino history--how tragic, but oh so interesting. We need more Bonifacios and Rizals, men who put their country ahead of themselves--and in this case of the Philippines--ahead of their families! I do know one thing. It's time to stop blaming the Spanish and the Americans for the problems here. I go to college here in Angeles City and no one at that level thinks that way, but I sure read about it ad nauseum from the Filipino educational elite. This looking for villains from the past to blame the present ills of society upon seems to be an obsession. I learned a saying during my time in the US Marines: FIDO! Forget It Drive On! "We are all UP graduates. We are our people's scholars, and they look to us for healing. Never have our people been as wounded as they are today. Go then and heal the nation. And you can do it, even if you must do it one patient at a time." She is very rare indeed. My impression of the UP grads...is that they have become elitists who mastered the arts of the "kami-kami" and "tayo-tayo" mentality, using this to gate out all others, the Filipino elitists who master the English grammar to a point that they take anyone who writes incorrect English grammar as beneath them. Yes, they are a people of scholars but look at the quality of leaders that have come out of that Institution, starting with Marcos. We are very proud and grateful that ABSCBN aired WOWOWEE ( nationwide ) because this program intention was for the poor people who are in need most of help from our kababayan and we salute you Willy as an instrument from this program because we believed that God has given you this role to help our poor people and we want you to know that we are very proud of YOU and abscbn for this great show you shared to those who are badly in needs financially . Mabuhay ang abscbn and mabuhay ka Willy and always remember God will keep on giving you more blessings and good health and also to abscbn staff and owner , WE are very PROUD of you because you don't know how happy we are for having this program wowowee para sa MASA . Mabuhay ang abscbn and mga Lopez family . Keep the good work and keep fighting the TRUTH because God will always be there for YOU. We love abscbn and more power to all your staff most especially Willy . I have given up on reading people's minds. Anyway, I think she meant UP students are scholars in the sense that UP students pay subsidized matriculation/fees. As to bad leadership, I think it can come from all schools where our ruling elite came from: secular or catholic schools, etc. Most, if not all, humans can potentially be good or bad leaders. Leadership tends to be bad when the majority is either ignorant or do not know nor understand what really is going on. And that's where we are in the homeland. If we can make the majority otherwise, then it can pressure the leadership to plan, decide and act for the common good. It's a very difficult task since there are strong opposing forces who want the majority stay ignorant. Therefore, those who have sincere concern for our homeland and people, fighting ignorance should be where efforts should be made; and thus help unify the majority in the struggle for radical changes. I admire your expressed faith in God. But I think it will help greatly if we do not rely on God to solve our homeland's problem. Instead, we should try to study and comprehend our socioeconomic problems (if you try to find time) so we can understand the roots of our problems, to enable us to identify sincere and true leadership and not just rely on recognizable names. It is only when we understand the "why,what,who,where and how" of our national predicament can we truly have a good basis for selecting as to who should be our leaders and for removing them, if needed. Let us not even rely on the CBCP or whoever. Of course, we can think about and consider what they say. But it's important that we study and think, a capacity God, as you may believe, gave us. Then plan, decide and act based on as much knowledge we can have. Am surprised that you like history, pretty rare for Americans. I wonder what kind of history you are into and for what purpose, if you have any. You say your college does not talk about "blaming" Spain or America. Am curious which college you attend. And Angeles City may have specifically local vested interests, to American presence, in not raising issues about America(or its foreign policy). You say we Filipinos need more Bonifacios and Rizals. You know, to regenerate such individuals, we Filipinos have to know, understand, interpret what they did and why. And those questions involve seriously looking and studying our history. And for those two guys you mentioned, the study necessitates analyzing the social conditions under the Spaniards, etc. Studying Philippine-American history is similarly imperative. Because the Filipinos' past under American intervention and occupation explains much of the present; not knowing and understanding the this past can only lead to a present that is mainly repetitions and maintenance of the socioeconomic problems --the predicament we Filipinos have up to now and for the next generations unless radical changes occur). Unfortunately, Philippine-American history is greatly glossed over in American official school/university textbooks and popular/mass editions. In these books, one will not see any coverage of the conflicting reasons for the American arrival and involvement in the Philippine revolution against Spain, the subsequent brutal American intervention and occupation of the islands. That is why Americans and Filipinos alike are mostly ignorant of what transpired then. I was not aware of that eventful period (indeed very controversial in the continent at the time)even after my time in the university, since nothing different from aforementioned official lines/books were available then and even now in most colleges and universities. It's understandable if you do not like to hear or read about them. You say MOVE ON. I say to where? Are Filipinos to move on with all the baggages of their past, unknown and uncorrected (as realized by those who have seriously studied our historical past). In most, if not all, human activity, you have to know the past, of what has been done so one can plan and work properly, before he moves on; whether we are talking of engineering, medicine, military tactics, troubleshooting cars, etc. It's difficult for a foreigner to appreciate, not just pay lip-service, to understand us. And it seems rare for Americans to empathize; as the American mind seems to see only through their own lenses and assumes that they are always right and noble vis-a-vis other countries; seems to have no patience for what it considers alien, that does not fit their "model." If most Americans knew their history based on what was available in their schooling, then the limited knowledge or awareness they got will only make them grow up believing that America never did any wrong that has long-lasting, negative effects. Which is dangerous. To me, that typical American thinking or outlook, developed by incomplete or misleading history, partly explains why despite the downfall 12+ years ago of the primary enemy i.e. Communism, new ones come out,e.g. Islamic extremists, Latin American resurgent radicalism, etc. And that's why Americans in general do not seem to get it, to understand why they are hated (despite all its heavily publicized foreign aid), as the saying goes. And believe me, it's not all due to envy (not all peoples or nations are materialists, as Americans tend to think otherwise). Oh, I have to quit here. Am going to another topic that may have to be discussed separately, some other time. 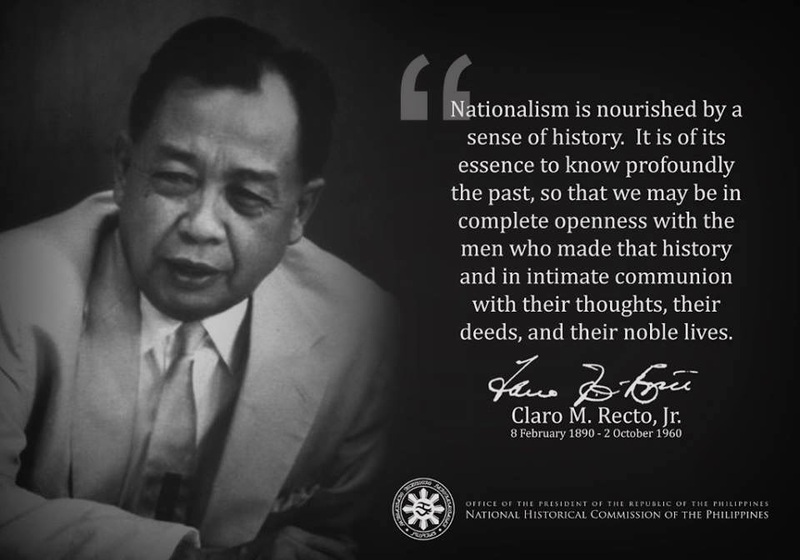 Lastly, let me remind you though that most Filipinos who consider themselves nationalists are not anti-American people, they are more appropriately anti-American foreign policy and anti-American or foreign business/transnationals to the extent that the Filipino peoeple and our country's sovereignty are ignored or taken for granted. I suppose you appreciate their big difference. It's just too good to be true if what was written by Dr. M.Padilla be realized by our politicians and the majority of the populace. The majority would agree, and such good essays have been written over and over again BUT are just FALLING ON DEAF EARS. I have seen many Filipinos striving to EXCEL, but the true killers of our people and economy are the political immaturity. Our politicians are fighting like small childrens and would agree to nothing. Who amomg our politicians would agree to personal sacrifice as was suggested by this essay? There could be some but they too have sunk to just observe evil bureaucracy. Majority RULES and evil is ruling the politics. In our prevailing system of politics if one is a good and honest politician his or her days are numbered. Even Gloria Arroyo has heard enough good advices but still pursuing the evil things she set her mind. It takes a strong and powerful force to heal our nation, not just people power. I also believe the majority of our people are now evil. What can we expect with an evil generation? With an evil generation THE VOICE OF THE PEOPLE IS NOT THE VOICE OF GOD BUT OF THE DEVIL. Good essays like this one are falling on DEAF ears because EVIL LISTENERS cannot comprehend them. True. There are still good people who are hopeful and maybe driven by a decent mind. Unfortunately, as you alluded to, the people who really count, i.e. the politicians, who can do something with a big impact on our homeland/society, know what needs to be done but do not act, because they do not really care for the ordinary citizens. And these politicians are so-called Christians. Even a few foreigners have expressed their surprise to the observed selfish, greedy attitudes and behaviors of these so-called leadership. These vices are most strongly bolstered by capitalism (though other -isms can produce the same). That is why the ordinary citizen is angry, frustrated and indifferent. And Filipinos take and absorb all these public theft and public circus partly due to their well-entrenched belief in the Christian teaching that all these things are temporary, that we are just passing through the world, that the reward for all these earthly miseries will be rewarded in a heavenly afterlife. Such belief is disastrous for the people and the country, it discourages thinking and acting in the here and now. That's what gave credence to Karl Marx's dictum about "religion as the opium of the people" during the 19th century (that's how backward we still are in terms of religious beliefs). It is so in our homeland. I admire the author of this essay. It tells the truth and it says it all. We have to help one another. Let’s not wait for the government to serve us but find a way to serve one another and live the life God has given us. We have to get up, move, do something and help ourselves. Don’t wait on someone to make things happen. Do something so that things will happen to you. God said, help yourselves and I’ll do the rest. I agree that our country is deteriorating because of a disease that’s killing it rapidly. The disease has to be stopped. How? I don’t think a bloody resolution is the medicine! I don’t think this can be cured by replacing the president by another corruptible! Are you sure this replacement will be a better leader….. he/she could be worse than the president right now. Think…… Discern….. and be intelligent in all your decision making.